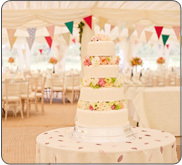 All décor such as swags and linings are available in a variety of colours so you can match up your wedding party! 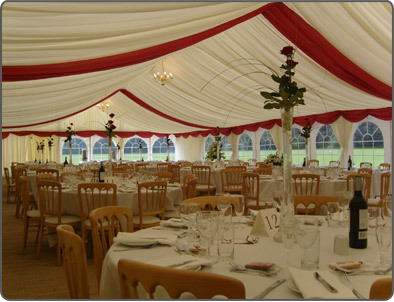 Choosing a Marquee for your special day means you can have the exact size venue you really need to accommodate your guests. 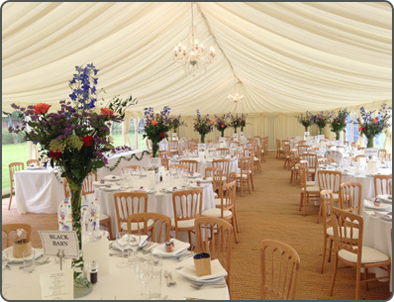 You have complete control of the layout and we can advise you on where to place the dance floor top table etc. Chairs and furniture are available in various styles and colours. We supply various lighting, we have white uplighters, LED lights, spot lights and a choice of chandeliers. Star light linings look exceptional when lights are dimmed for the evening entertainment. You can also choose dancefloors from wooden, black and white, mirrored and more. "Dear Ross. I very much want to thank you on behalf of both sets of parents. You and your staff were so efficient and the marquee looked splendid. Even the toilets were much admired! From our first contact you were very helpful and courteous and coped calmly with our indecision and later changes of plan. It was also reassuring to have your support on site throughout the weekend preparations and the events themselves. How you cleared everything away so quickly and clearly was amazing. I would be happy to provide a recommendation for you. With Kind Regards,Linda"